On Monday, I did a little webinar with the University of Illinois Urbana-Champaign’s Center for Language Instruction and Coordination. 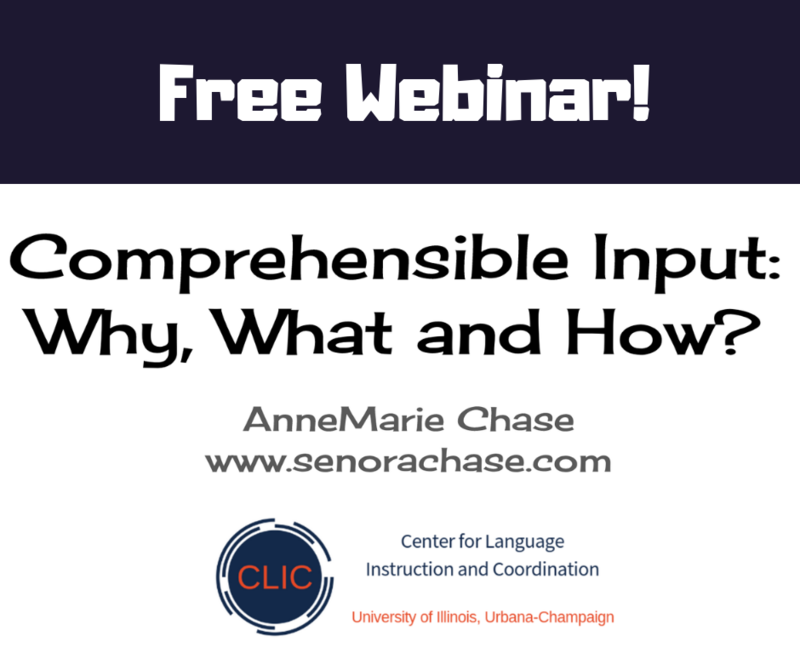 Turns out the little webinar wasn’t so little…700 people registered to hear more about Teaching with Comprehensible Input! Holy smokes! Unfortunately the webinar platform could only host 250…so a lot of people were not able to join us. I feel really awful about that…so I’ll try to make it up to you! Here’s a recording of the webinar! And here’s the powerpoint I used! Here are all the links I mention during the webinar…and some I didn’t mention, but support to what we’re talking about! What is Comprehensible Input anyway? Want more CI Training? Comprehensible Online use code AnneMarie19 for $25 off! When it looks like kids are getting bored…. Get them moving! In my classes, all their grades are tied to the four skills and the input skills (reading, listening) are weighted more heavily in Level 1 than the output skills. Here’s a parent letter explaining our Department’s grading philosophy and policies. To Assess Listening and Reading, I’m really happy with my ACTFL Quick Quizzes To assess speaking, I like to use my Magic Cards to make speaking assessments really low stress for my little darlings! To assess writing, we do quick writes once a month. They have 5 minutes to write- sometimes I have them make up a story, sometimes they write about a Movie Talk we’ve done. Here’s an example of a level 1 Unit Test: Celebrations of Knowledge and here’s what my Level 4 Celebrations of Knowledge look like. All their assessments go into a portfolio and they frequently reflect on their ACTFL proficiency level. How do you check for comprehension? Lots of ways! Sometimes it’s towards the whole class. I might ask a question to review some information we’ve already decided, “What’s the guys name?” or “Where does the family live?” and I’d expect the whole class to answer chorally, in Spanish. Sometimes I’ll say something wrong (in Spanish) and let them correct it (Also in Spanish): “So, our guy is short and fat, right?” (and they’ll holler back, “NO, he’s tall and handsome!”) In both of those cases, I’m watching to see if they answer back right away, or is there is hesitation or silence. A quick, confident response tells me that their comprehension is good. Hesitation or silence tells me I need to slow down, revisit it, spend more time making those structures comprehensible. Sometimes they’ll gesture to show their comprehension: I’ll say a statement and they give me a thumbs up if it’s true, or a thumbs down if it’s false. Other times, I’ll pull out my Magic Cards to gauge their comprehension. I’ll call a specific kiddo, ask them to summarize the information in English, and they’ll get a listening grade on their card. Other times I’ll have everyone turn to a buddy to summarize the information (either in English or Spanish) and listen to a few particular students to see how much they’re comprehending. And one last thing…teach to their eyes! You can see who’s tracking with you, who you’ve lost, who is off in La La Land. Does PQA need to involve lots of questions, or can it be just a few? There’s not really a magic number… I just PQA as long as kids are engaged and we’re enjoying ourselves. Sometimes a question is a dud…if you’re not feeling it…skip it. If you’re having a lot of fun with one (like in the example picture, which teachers yell bad words?) milk it for all it’s worth! Remember, the goal with PQA is to talk with your kiddos and get lots of repetitions of your target structure. What is pop-up grammar? Any references to consult about that? During Write & Discuss: “Hey clase, tell your partner what the “n” on the back of “van” means? During Movie Talk: “What’s “era” mean? How would it change if I said “es” instead of “era”? Wanna see it in action? Here’s the hilarious Sarah Breckley, demonstrating POP UP grammar! What does CI look like in a block type schedule/alternating schedule? Not sure about an alternate schedule, but I teach on 90 blocks. And I wrote about it here: Breaking up the Block: Comprehensible Input and long class periods. CI seems very teacher-centered. Do you students ever interact between themselves? Since CI is Input Centered, a lot of times it feels like it’s teacher centered, since it’s the teacher loading them up with input. BUT…reading is another great way to load them up with input and the teacher gets a break! Kids still interact though…like in the POP UP example, we do a lot of Turn and Talk to your Buddy. We’ll “volleyball read”, where students read and translate with a partner, alternating each sentence. And we play a lot of games that are collaborative…keep reading! Could you provide examples of input games? Do you teach novels in level 1? I have a confession…I prefer doing Free Reading in class, rather than teaching whole class novels. But…I do think it’s important to read at least 1 novel together in level 1, just so they know they can do it. This year I taught Bart quiere un gato which is so much fun because it’s a choose-your-own-adventure book. At the end of each page, we decided the next phase of the adventure. Would I need to redesign our curriculum to incorporate CI with our textbook? We tossed our textbook years ago, but we still follow the themes from Realidades in Level 1 and 2. So…you don’t have to get rid of everything to try CI…just add it in little by little. The more you use, the bigger gains you’ll see! ¡Poco a poco, se va lejos! If you’re looking for a ready to go CI curriculum, check out Martina Bex’s Somos. Hopefully that was helpful, if you’ve got other questions, feel free to send me a message! Thanks for joining us! Thank you very much for the webinar and the answers. All of this was really useful.